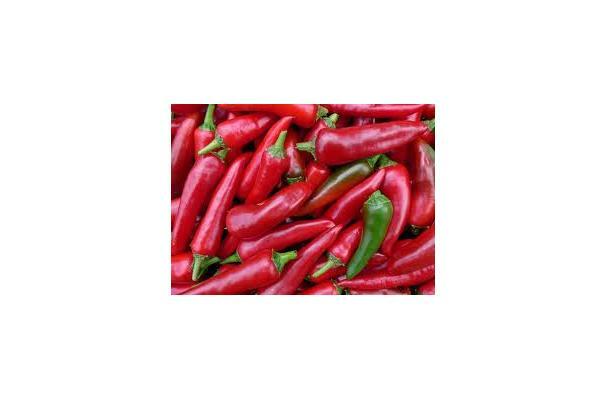 Red chili peppers are vegetables that originated in the Americas and are used primarily in Mexican and South American cuisine, but also in India (known as lal mirchi red). Red chili peppers are hotter than green chili peppers. They range from an orange shade to dark red. The flavor comes from the skin, the brighter the pepper the hotter it is. It ranges from 30,000-50,000 Scolville units (Jalapenos are 25,000-30,000). This can vary from year to year and region to region. It is known to be pungent and have a strong biting taste.